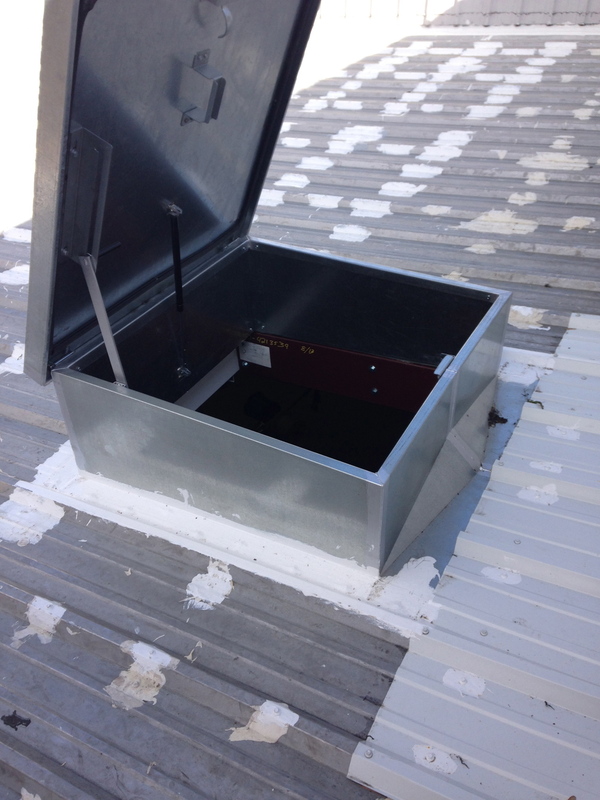 Metal building roof hatch. When installing a roof hatch, or any roof-top penetration to a sloped metal roof it is important to use the proper curb. Notice the pre-formed water diversion flange in the front of the curb. The curb is fabricated to match the slope of the roof, keeping the top of the penetration level. The proper curb also reduces future maintenance because it greatly reduces the future chance of leaks. Another important installation feature is to make sure the underside support structure is sufficient, and made of the correct materials. Use Cee's or Zee's. If angle iron is used (it has three rough edges, two of which will come into contact with the insulation) the steel tends to cut into the insulation facing and rip it. A metal roof moves as it expands and contracts due to temperature changes, roof traffic also causes roof movement. So for the curbs under side support structure installation we only use rolled Cee's or Zee's which have rounded corners. It is important to use the correct gauge of steel. The area will have foot traffic, of course, so the roof should not be allowed to have too much flex. See the picture on the bottom left below. 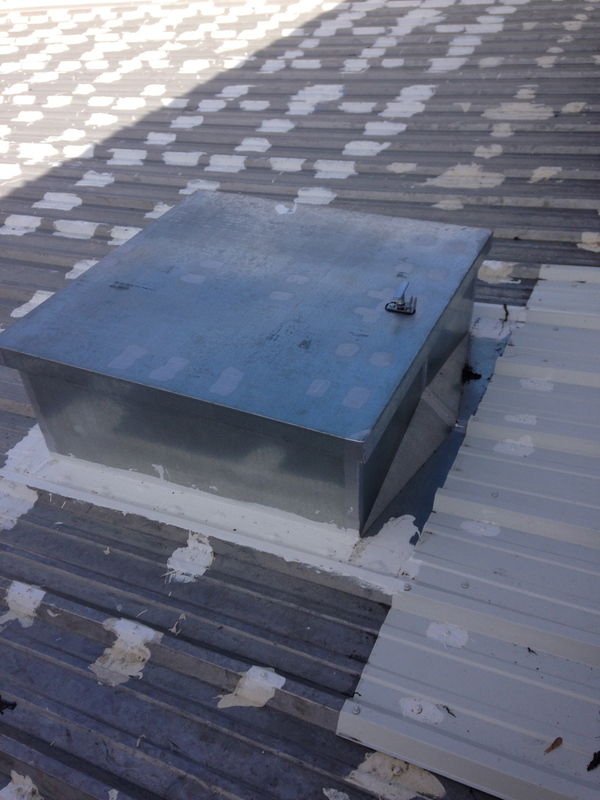 Our installations are designed and installed in compliance with OSHA requirements. 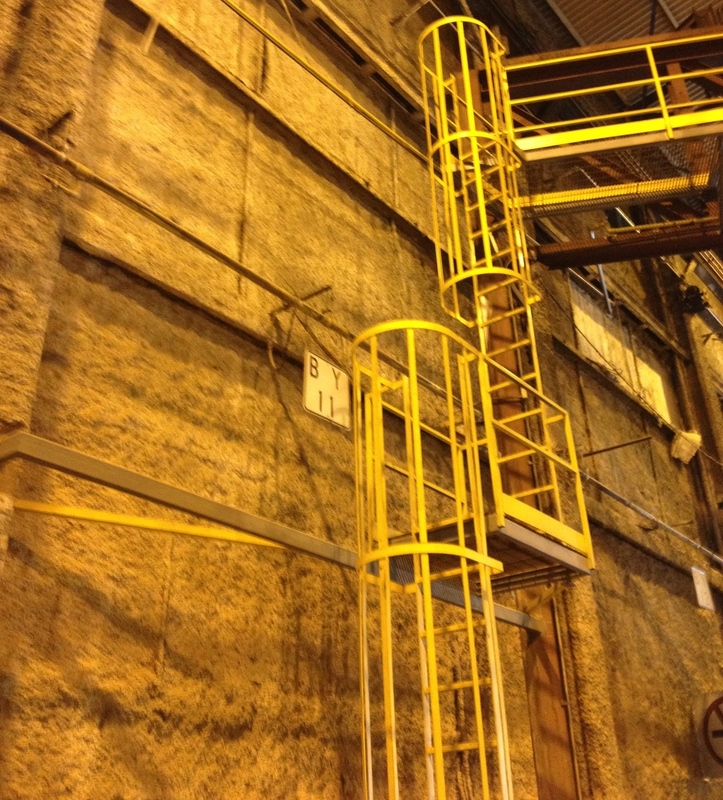 Safety yellow paint, cages and interim platforms as required by OSHA. Metal building repairs including leak repairs, Houston TX, MI, IN, IL, OH.